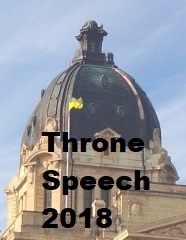 Premier Scott Moe said the government ended the fall sitting of the legislative session by delivering on priorities for the economy and people of Saskatchewan. As the threat of a federal carbon tax continues to face Saskatchewan, the Government of Saskatchewan is implementing Prairie Resilience, the made-in-Saskatchewan climate change plan supported by industry. This includes legislation introduced this fall to establish intensity-based performance standards for large emitters as well as the new Climate Resilience Measurement Framework, the first of its kind in Canada, with 25 different measures to monitor and enhance Saskatchewan’s resilience to climate change. Safety was also a focus of the fall session with the introduction of mandatory minimum training requirements of 121.5 hours for commercial semi drivers, a proposed enhancement to rural policing to allow municipalities with populations under 500 to join regional police services and amendments to trespassing legislation which will afford rural land owners the same requirements for land access as urban land owners. 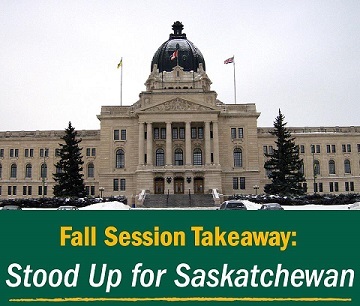 To help Saskatchewan people who may need time off from work to care for family members, changes to The Saskatchewan Employment Act will create a new critically ill adult leave, expand parental leave and add an additional week of maternity leave. More people who face health challenges because of their jobs will be covered through changes to The Workers’ Compensation Act, making Saskatchewan a leader in the country for the number of occupational diseases firefighters will have presumptive coverage for. Saskatchewan announced plans to be the first province in Canada with Clare’s Law, legislation to provide police services with a framework to disclose information about someone’s violent past to intimate partners who may be at risk. Interpersonal violence leave will also be expanded to include sexual violence of any kind, allowing Saskatchewan residents to take time off to seek medical attention or access supports. This session, the government announced a commitment to apologize to those in our province affected by the Sixties Scoop. Sharing Circles, led by the Sixties Scoop Indigenous Society of Saskatchewan, took place across the province to help inform the apology. Infrastructure investments continued with Saskatchewan Hospital North Battleford nearing completion, the Jim Pattison Children’s Hospital reaching 92 per cent completion, working on rural cellular service with another 50 communities to see better coverage by the spring and the opening of new bridges, passing lanes and intersection improvements across the province. The next sitting of the Legislative Assembly is scheduled to begin March 4, 2019.